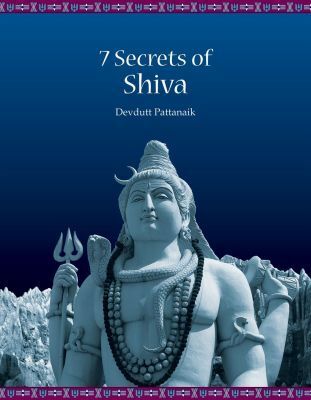 In 7 Secrets Of Shiva, Devdutt Pattanaik attempts to dissociate the symbolic form of Lord Shiva from his physical form, by providing a detailed analysis of the subjective and metaphysical aspects rather than the objective aspects. In 7 Secrets Of Shiva, Pattanaik begins his analysis of Hindu mythology by looking at the conflict between Western methodology and Hindu devotees. He states that when Western scholars and academicians examine Hindu mythological symbols such as the Shiva Linga, they are more concerned about the objective representation. Objectively it is a phallus, but subjectively it represents a mind that is unstirred and happy. Hindu devotees are more concerned with the latter explanation and therefore ignore the former during their worship. In a similar style of analysis, Pattanaik goes on to decipher the seven forms of Lord Shiva. In the first chapter titled Lingeshwara, the author goes beyond the meaning of a phallic symbol. Instead, the Lingeshwara represents mental stimulation, happiness, and a focused mind. In the second chapter titled Bhairava, Lord Shiva’s form rids fear and predation. With the banishment of fear, the mind is able to continue on the path to inner happiness. In the third and fourth chapters titled Shankara and Bholenath, Shiva is portrayed as a householder and as the counterpart of the goddess Shakti. Their union symbolises the propagation of the species. It also explains how the goddess attempts to get Shiva to participate in the material world. The fifth and sixth chapters are concerned with Shiva’s sons, Ganesha and Kartikeya. It explains how Ganesha removes scarcity, and promotes a good life, prosperity, and knowledge. Kartikeya wards off evil doers and predation. The final chapter is titled Nataraja, and it represents the universe’s movement. When Lord Shiva performed the Tandava, he was destroying the Universe. Apart from deciphering the symbolism behind Hindu mythology, Pattanaik has included illustrations, photographs, poster art, and blurbs to give readers a visual dimension to the explanation. Dr. Devdutt Pattanaik is an author, entrepreneur, and Chief Belief Officer at the Future Group. He has authored over twenty books dealing with Hindu mythology. Some of these titles are 99 Thoughts of Ganesha, Hanuman-An Introduction, The Pregnant King, Indra Finds Happiness, Kama v/s Yama, The Goddess Of India, Jaya, The Book Of Kali, and Myth = Mithya. Apart from writing, he has over fifteen years of experience as a medical doctor, working for companies such as Sanofi Aventis and Apollo Health Street. He has also worked with Ernst and Young as a Business Advisor. Pattanaik is currently an inspirational speaker and leadership coach at many organizations. Business Sutra and Shastrarth are TV shows that were hosted by him on CNBC TV-18 and CNBC Awaaz respectively. Pattanaik has written more than 25 books. Cinematix presents a series of three short videos by well-known mythologist Devdutt Pattanaik on Shiva as Nataraja – the Lord of Dance. This video talks about the symbolism in the idol of the Nataraja.